This recipe can EASILY be doubled- in fact I double it every time I make it and freeze half for another day. When you finish making it, let the soup cool down, pour into a Ziploc bag or other freezer container and store for another day! When you want to eat it, thaw it in the fridge and re-heat it on the stove top until warm (or even microwave it). On a cold winter day, all I want is a warm bowl of soup . . . and this is one of our family's favorites. Place your bouillon cubes, water, celery, potatoes, and carrots in a large pot and bring to a boil. Boil until bouillon cubes have dissolved. Add your bag of frozen veggies and turn heat down to low (I usually set my burner at 3 out of 10). Place lid on top of pot and let simmer for 30-40 minutes (add water if necessary). Add cream of chicken soup, milk, and Velveeta cheese. Stir constantly until cheese is all melted. Serve with bread bowls or warm rolls. This sounds like comfort soup - love it! I like lightening stuff up like you did here because you rarely miss the flavor. Sounds delicious except...I can't stand Velveta. Do you think it would work with real Cheddar? I agree, would this work with real cheddar cheese? I have never tried it will real cheddar cheese . . . but I think that it still might work. Let me know if you try it! 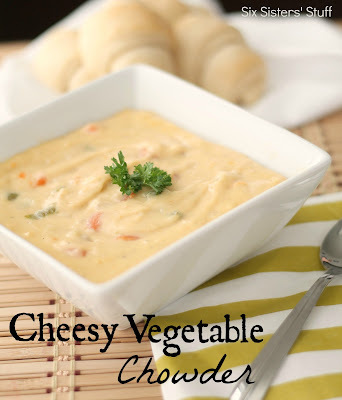 I just made this today, doubled the recipe, and used half the velveeta, replacing the rest with shredded cheddar. My husband is a picky eater and hates "fake" cheese. He loved it, as did my 5-year-old, who kept raving "Oh, it's SO GOOD!" It had the flavor of the cheddar and the even creaminess of the velveeta. That looks excellent, found you on Pinterest. I love all the veggies in this. Thanks so much for sharing it! Do you cook the potatoes and carrots first or do you put them in raw? Just make the entire recipe as directed. After it cools down you can freeze it. Hi. How many servings per recipe? Just click on the MAGIC button under the picture and then click on NUTRITION. It will give you all of the nutritional information and servings. I just made this, and it's AMAZING! I used regular block cheese instead of velveta (I used sharp cheddar) and it turned out amazing!!! This is a great recipe! It is a little misleading under the "meatless" recipes as it does contain cream of chicken soup though. We use cream of brocoli soup or cream of celery soup instead of the cream of chicken to keep it meatless for my daughter. We have not tried this particular recipe in the slow cooker. But after reading over the recipe it may be fine. Let us know how it all turns out. You'll want to make sure your veggies cook through. Just watch it closely! Do you have to cook it all before being able to freeze it? I'm wanting to make for a freezer group so quick is best! I have only ever cooked it completely and then frozen it, so I don't know if it would work or not if it wasn't completely cooked. Let us know if you try it!